Information portal for the Minnesota and Upper Midwest pool and billiards player community. Includes information on tournaments, leagues, advice, newsletters, pool hall locator, and discussion forums. The Midwests billiards site listing billiard halls, taverns, bars, billiard cafes and links plus articles on pool and billiards. Links to billiards sites, both virtual and real game. The on-line complement of the most comprehensive magazine in billiards. The premier place on the Web for on-site coverage of professional Mens and Womens tournament action. Features billiards and pool articles, essays, and fiction, including many with how-to diagrams and graphics. The CAT is a womens 9-Ball billiards tour with a mission to support and promote the growth of womens amateur billiards in the Mid-Atlantic region of the United States. Dedicated to building a sense of community through the advancement of the sport of amateur billiards. Junior and adult handicap and non-handicap. Includes 7-Ball, 8-Ball, 9-Ball, 10-Ball and Bar-Room game rules. Links to pool tournaments, shop for billiards supplies, a forum, and photographs. Includes events, rankings and rules. Dutch carom billiards champion. Results, photos, guestbook. Events, rankings, and information for the league in Victoria, Australia. Features 54 lanes with automatic scoring. Information about leagues, tournaments, special events, billiards, and laser tag. ('The Black Widow') Billiards professional champion. Contains appearance schedule, personal info, awards and achievements, and biography. An establishment in central Ontario featuring party rooms, Rock n Bowl, billiards and arcade. Links to a wide variety of how-to guides covering topics from rules to form. Bowling center with information on regular hours, summer and fall leagues, billiards, events calendar, and location map. Information on teams, points tables and player statistics for the Sydney based competition. A fun, silly, bizarre game that incorporates elements of pool (billiards), humorous movies, and various unjustified pieces of equipment. Personal and commercial billiard sites, magazines, professional players, tournaments and leagues. Places To Play in the St. Louis Area. Coverage of professional and amateur tournaments. This site contains information on pool, along with links. A 5-pin bowling establishment also featuring party rooms, Rock n Bowl, billiards and arcade. Offers news, resources, fixtures and results for a variety of leagues and tournaments. Created by a Bali International School Student, this site offers a overview of the sports history, development, and local halls in Bali. Offers open play, league, and tournament information. Includes details about pro shop, Snookers Billiards, game room, snack bar, and driving directions. Offers news, resources, fixtures and results for a variety of leagues and tournaments in the United Kingdom and Europe. 30 Parkway Bowl El Cajon. 80+ year old league played in Veterans clubs throughout Winnipeg. Standing, statistics, and rules. If the business hours of MNBilliards.com in may vary on holidays like Valentine’s Day, Washington’s Birthday, St. Patrick’s Day, Easter, Easter eve and Mother’s day. We display standard opening hours and price ranges in our profile site. 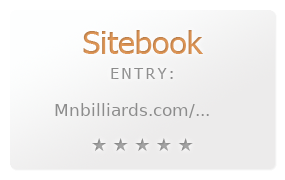 We recommend to check out mnbilliards.com/ for further information. You can also search for Alternatives for mnbilliards.com/ on our Review Site Sitebook.org All trademarks are the property of their respective owners. If we should delete this entry, please send us a short E-Mail.